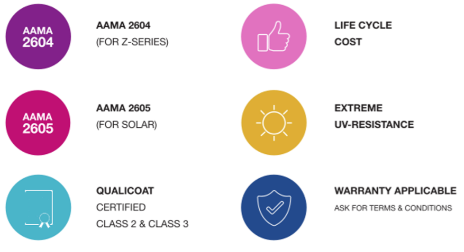 Z-series™ is the Protech/Oxyplast Group’s line of Super Durable powder coatings. These powders are formulated to meet the requirements of AAMA 2604 and carry a five-year warranty when properly applied and fully cured. Z-series™ powders are extremely resistant to all weather conditions and are an ideal solution to a multitude of exterior applications. They are available in a wide range of colours and textures and like all Protech/Oxyplast powders, Z-series™ powders emit no harmful VOC’s and are environmentally friendly.